The complete list of narrators includes 罗林珊 - 羅林珊 - Luo Linshan | 李佳怡 - 李佳怡 - Li Jiayi | 刘世元 - 劉世元 - Liu Shiyuan | 叮当 - 叮噹 Dingdang. Please note: This audiobook is in Mandarin. Best story teller for My daughter, she loves and we love it. It is a very classical story for all Chinese and the way it has been narrated is lovely and very attractive to the kids. Both of the musics and story is well designed!!! Highly recommend to all the Chinese families!!! My 7 year old kids who do not like to speak Mandarin asked to listen to this book again and again...all 11 hours of it...and we have done that 4 or 5 times already...that speaks volumes for this title! Wonderful music, sound effects (especially the fighting scenes! ), narration and performance by an ensemble cast captivate the listeners, kids and adults alike. 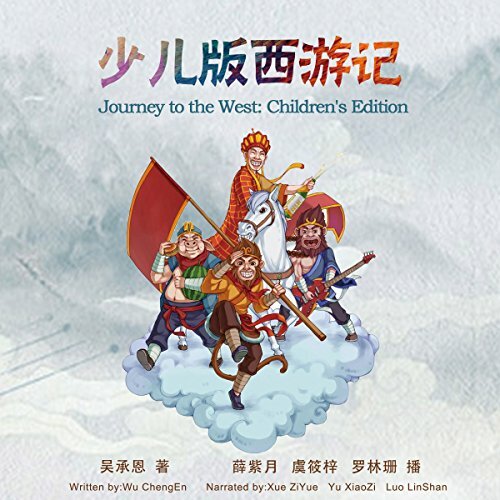 The narration and conversations adapted from the chinese classic are simple enough so that young listeners will be able to understand most or the key parts of the story and still remain engaging for adults. This is a true gem. The only complaint is that not all the adventures in the classic are included or had the storylines fully depicted, probably to keep its size / length practical. Fantastic! Really loved it ! ! !